Craigslist is one of the most popular and effective ways to connect adoptable pets with new families. But Craigslist catches flack from a small, but vocal segment of the animal welfare community because of misconceptions surrounding its usage. This post is intended to empower pet lovers to use Craigslist as a tool for helping pets in need, whether you’re someone who is rehoming a pet or you’re a shelter/rescue/do-gooder trying to get pets adopted. 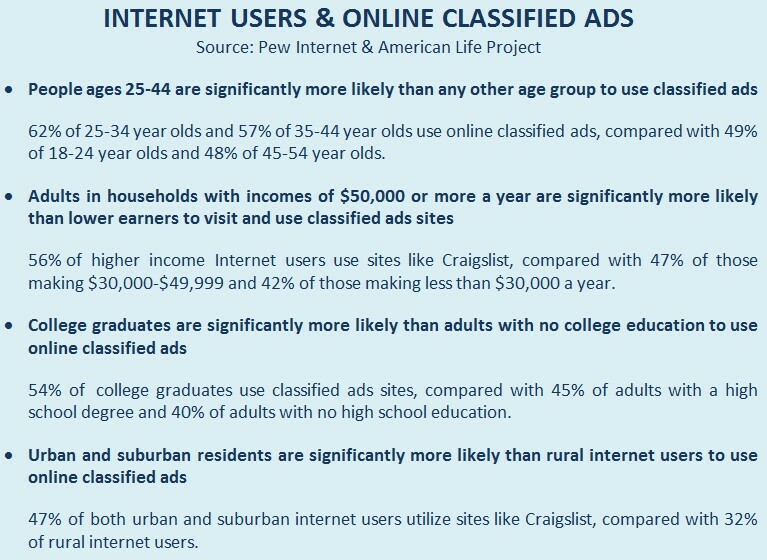 Below are some statistics on the segments most likely to use Craigslist and other online classified ads. Is There a Higher Risk of Animal Abuse or Neglect? There is no evidence to support the myth that people who abuse or neglect animals are more likely to acquire them via Craigslist than by other means. While rare and isolated cases have allegedly occurred, the problem lies with the abhorrent or neglectful behavior of the person, not the method in which the animal was obtained. Should Shelters and Rescues Use Craigslist? Yes! For shelters and rescue groups, Craigslist is a highly effective way to direct large numbers of adopters to your organization. Unlike online stores like Amazon.com that allow users to buy items directly, Craigslist is merely a “middleman” for connecting people with the “products” they’re seeking. It’s the virtual equivalent of hanging flyers on telephone polls: it grabs people’s attention and directs them to someone who can provide more info. At that point, the same screening and matchmaking processes apply whether they found you through Craigslist or St. Francis of Assisi himself. Best of all? Unlike other online advertising outlets, Craigslist is FREE! One rescue group that’s using Craigslist to connect people and pets is One Tail at a Time in Chicago. I asked their Board President and Co-Founder Heather Owen to share her experiences on this topic. I’ve been involved in animal welfare for 8 years and serve as Board President for One Tail at a Time dog rescue in Chicago. Throughout the years Craigslist has been a goldmine of passionate, intelligent, and effective advocates and animal lovers. I met two of our board members through Craigslist: one has been my “rescue partner in crime” for 7 years and the other has fostered more than 70 dogs! 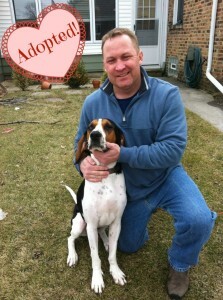 Craigslist has also been a great resource in finding adopters. Here are a few of the many successful adoptions Craigslist helped make possible. Rocco was one of One Tail at a Time’s early dogs. I posted him on Craigslist once a week until he found his forever home through a listing with David and Lisa. 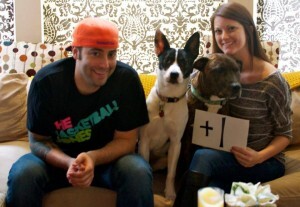 Not only do they love and care for Rocco, but they adopted Elsie from us too! They are the type of home rescues dream about. 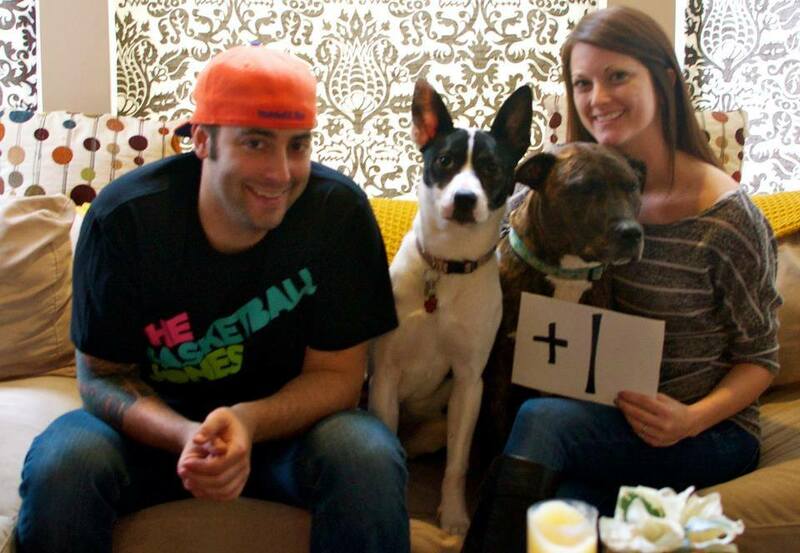 Here they are with Rocco and Elsie, announcing their baby-on-the-way! Chance was a bony Coonhound with big floppy ears and some behavior “quirks” which made rehoming difficult. I posted him every other day on Craigslist until we found Officer Mickey, a police officer who fell in love with this dorky Coonhound and made a forever dog out of him. He built a custom kennel, enlisted help from his neighbors to dog-sit, and never gave up on Chance. It’s one of my favorite One Tail at a Time love stories to date! 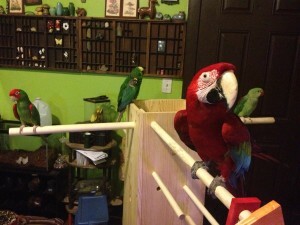 Last summer I rehomed my parents’ parrots, Sylvester and Oliver, via Craigslist. They cared for the birds but did not give them the exceptional enrichment that parrots deserve. They told me if I could find a better home than theirs, they would rehome them… and did I ever. They now live with a bird trainer who has a “jungle room” for his birds and even takes them on hikes in a special bird carrier. Every time I get updates my heart swells with happiness. Oh, and we did not charge a rehoming fee! At One Tail at a Time, we routinely find foster homes, donors, like-minded rescuers, and forever homes through Craigslist. If this avenue for finding forever homes ever closed, our adoption numbers would decrease. Craiglist is an efficient and popular way for members of the community to look for a pet. It’s also a very efficient way for pet owners to find new homes for pets they can no longer care for. If we take away the ability for pet owners to find new homes for their pets, we are going to place an extreme burden on our already extremely burdened animal rescues and shelters. 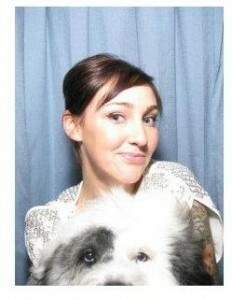 Instead of shutting down Craigslist, let’s empower pet owners by showing them ways to safely rehome a pet. Let’s talk to them about reference checks and applications so that they can rehome safely without burdening shelters. 1. Talk to the person! Have a conversation and use your instincts. 2. Use an application to gather information and keep data on the potential adopter. 3. Check personal references and veterinary references to make sure they are who they say they are and take care of the pets they say they take care of. 4. When completing the adoption, visit their home so you can see how and where your pet will live. Take a companion with you. 5. Make sure to have your pet altered and vaccinated prior to rehoming. 6. Keep in touch with adopters over time. Thank you, Heather, for showing us how Craigslist can be a win-win tool for connecting pet lovers! Click here to learn more about One Tail at a Time and to support their efforts.